"Normally when I start a project, I don’t start with a story…it’s more that I start with some kind of interest, or question, then I start some research, but everything is hand in hand, researching and casting, writing." Western opens in the UK this week. Grisebach’s film is deceptively simple, seemingly sparse, but emotions run deep. It is visually close to documentary filmmaking. In the heat of a Bulgarian summer, in the countryside, near the border with Greece, tensions rise and recede before coming to a head. A small group of German construction workers are preparing the ground for an infrastructure project. One of the workers, Meinhard, an ex-Legionnaire, seems to be a self-sufficient loner. He does not take to the group’s uneven attempts at overly expressed manliness. Soon, however, Meinhard finds himself in uncomfortable territory, as he is drawn towards the local community. They in turn offer him a kind of uneasy acceptance. His idealised view of them starts to fragment, just as their view of him fragments too. The construction workers and the community are on the cusp of conflict, and edgily negotiate territory and resources. Meanwhile, questions of personal identity and belonging come painfully to the fore. Grisebach had a fantastic success in Cannes with Western. It’s her third feature film, after a long quiet period. Her previous film, Longing, was released in 2006. The acclaim seems to mark a watershed, though the director emphasises the continuity in her work. For me, the film is totally in correspondence with the films I made before. I didn’t make so many films. I did three feature films and there was a big break between this film and the film before… Ten years. I didn’t realise so much it was ten years (laughs) because for me, real life between the films is also interesting. It took me really quite a while to understand the project myself, and to find how the story was really working. So, I was working with the same cinematographer, there is a kind of dialogue, starting from the first film, to now, how we would like to make our films together. Western is an intricate and complex film, with ambivalent characters trying to find their way towards, perhaps, social acceptance, if not self-acceptance. The behaviours are often ambiguous. It takes a while to decipher people’s faces. Their reactions are sometimes unexpected. There is a profound language barrier between the construction workers and the locals. Gradually, thanks to sign language and goodwill, some of the characters start to understand each other, and communicate more fluently. There are bittersweet moments as well as tragicomic ones, and, from a UK point of view, occasionally counter-intuitive reactions. The locals refer back to the Second World War, and the German presence at that time, but positively. The film carries a multitude of small touches, details which build up, gradually, towards a deeply unsettling, but understandable, conclusion. The story feels as if it has been built up delicately, paint stroke after paint stroke, from an idea or a mood, and not from a storyline. Yet it remains fascinating and narratively coherent. This is quite different to the received wisdom of mainstream scriptwriting, where a script is fleshed out from a pre-determined story, which serves as scaffolding for the narrative. Grisebach’s approach is very different, and far more intuitive. Normally when I start a project, I don’t start with a story…it’s more that I start with some kind of interest, or question, then I start some research, but everything is hand in hand, researching and casting, writing. And so, when I am writing, I have some kind of under-construction, so, subtext, things which are interesting to me, and then I try to find a surface, a kind of story or setting I can tell, of motifs which are interesting for the film, this took me quite a while, to understand myself, how this construction is working. This kind of approach means that the story setting, the characters, and the action, could theoretically turn out to be a world away from those in the final film – it’s the underlying ideas that matter. In a way yes, I made some decisions, it’s kind of step by step, that I found the story for myself, that I developed the story for myself, but in a way, the beginning is quite abstract. The touches which build up into the narrative are not always plot points but rather micro-moments, which sometimes push the story forward, and sometimes simply establish a certain mood which lingers in the mind. For me, it is always interesting… It’s so funny, because with my colleague, she’s also a director, from Austria, Jessica Hausner, she did Lourdes (2009), and Amour Fou (2014), and when we were students, just by joke, we had a club, “The Plot Point Enemies”… (laughs) but plot points are very important. And now for me, it’s always interesting to create sometimes real plot points, sometimes fake plot points, like to create suspense, you have more space, to tell other things, like atmosphere, and to open the space. There is one director, I admire a lot for this, Maurice Pialat, some people say he had no talent for dramaturgy, but for me he is like a master because he breaks this ninety-minute feeling, and you have really the feeling you are spending some time with something you can’t explain, it’s bigger than these ninety minutes… So that was also a question, for the structure of the film, this balance between story driven, action driven, and then to create space for something different. 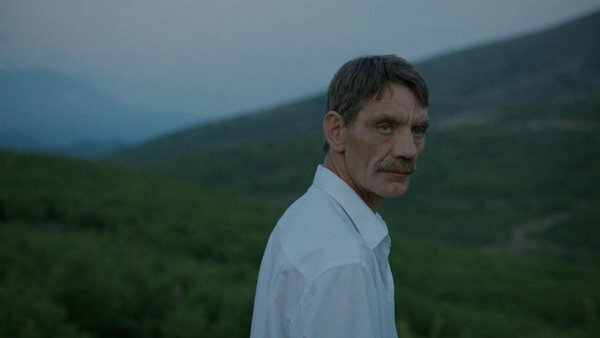 The imagery is powerful – the close-ups on Meinhard’s tanned, lined face, the constant smoking by almost all the characters in the film, the vast landscapes. The story even features a white horse. At the beginning of the story, the workers act as if they were settlers, unaware that they are guests on someone else’s land, and that the benevolence of their hosts is conditional. The motifs of the Western genre, announced loud and clear in the film’s title, imbue this tale of ordinary people with justified gravity. Why did Grisebach choose to work in that particular genre? I watched a lot of Westerns when I was a little girl, together with my father. I really wanted to return to this genre, to see what it is about. I was very interested in these male characters, this masculinity, so this staging of a face, not allowed to show emotions, but there are a lot of emotions behind, or these male characters who are looking for some kind of freedom, or independence, or meaning, destiny in life, but at the same time maybe they only want to come home. For me, it’s a genre which tells us the most about the construction of our society, so what is our law, the law of empathy, or the law of the fittest. So this was really one of my starting points. The other thing, was that for years, I was interested to do something about this latent xenophobia, you can find everywhere, this impulse to put yourself on a higher status, when you meet somebody who is strange to you. The dialogues in the film have an unusual authenticity, and this is especially noticeable since Grisebach works with non-professional actors. She is known for her very different way of working with actors. While she writes the dialogue ahead of time, she then engages in a process during which the performers make the language and the ideas their own. It’s a mix, I write kind of a script, which doesn’t look like a script, I write dialogues. Before every night, I write something, but for me it’s also very important to put this aside, and then to tell the actors the dialogue, this is the moment of transformation sometimes – so, because I have to re-memorise my dialogue, and then they have to re-memorise, and understand… I was always a bit afraid, maybe also because I am not working with professional actors…. To learn a text., and then it’s like, to them maybe this method of memorising something you understand with your emotions, it’s very helpful. So, it’s an important interaction, to create this. We thought a lot about the scene before, but then this is the moment to see how it is working. Grisebach also has a different approach to casting, prospecting streets, noticing strangers’ features and body language. When she found Meinhard Neumann, who plays the central character in Western, it was a chance meeting in Brandenburg, and it took several years before the project crystallised. Thank you for submitting to our newsletter, we hope this is the beginning of a beautiful friendship.